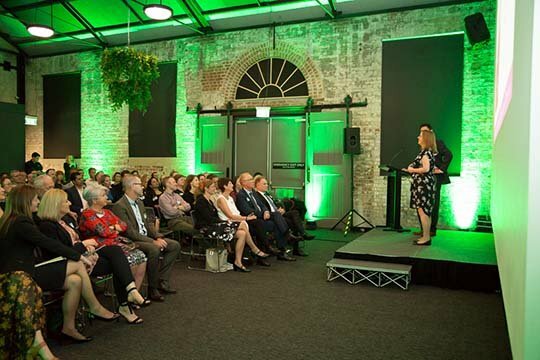 Three Hunter Valley-based charities have received a funding boost after pitching for their stake in $100,000 of funding at last week's event celebrating the tenth anniversary of the nib foundation. The foundation has committed over $17 million to more than 120 partners during its ten years. The Australian Institute of Rehabilitation (AIN) received the highest funding from the pitch event with $39,000 to provide additional robotic therapy sessions to local residents living with physical disabilities. Share the Dignity received a total of $33,400. It will go towards installing further Dignity Vending Machines containing basic sanitary items in the Hunter region for women experiencing homelessness and domestic violence. Waves of Wellness took home $27,600 to support the design and pilot of a new trauma-specific surf program for young people in the Hunter struggling with mental health. The event saw the three charities pitch for their cause to 100 guests who each received $900 of nib foundation funding to pledge to the charity they believed was most deserving on the night. In addition, the nib 'People's Choice' public vote held online saw nib's members and the community vote for their favourite charity to receive $10,000, with Share the Dignity named as the lucky recipient. nib foundation Executive Officer, Amy Tribe, said the funding injection will enable the three charities to continue to tackle key health issues in the Hunter. "This funding will not only allow AIN, Share the Dignity and Waves of Wellness to continue to improve health and wellbeing outcomes of vulnerable and disadvantaged communities, but it will also help them to expand their work in our local region," said Ms Tribe. "We look forward to seeing our funding come to life to create a positive impact on mental health, women's health rights and neuro-recovery for Australians living with disability - diverse yet equally important issues facing our community today." "We are excited to continue to grow as we look to support more preventative health initiatives that align with our mission of helping people and communities live healthier lives," added Ms Tribe.